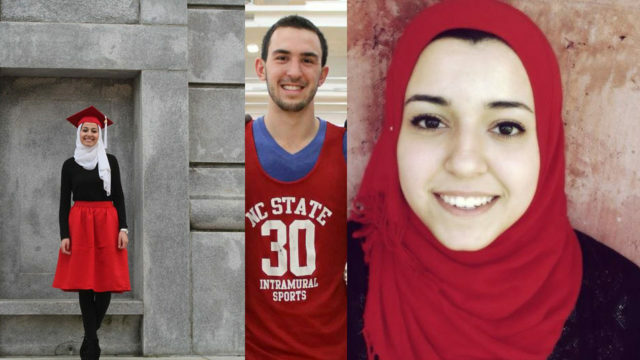 Feb. 13, 2015—Today, Muslim Advocates and 149 leading civil rights, faith, community, and civic groups sent a joint letter to U.S. Attorney General Eric Holder urging him to open a full and rigorous federal hate crime investigation into the brutal murders of Deah Shaddy Barakat, his wife Yusor Mohammad Abu-Salha, and her sister, Razan Mohammad Abu-Salha. Though details about this incident continue to unfold, many accounts suggest that these attacks were motivated by hate. The circumstances surrounding the incident—previous threats by Craig Hicks, combined with the sentiment expressed in his social media posts—warrant a federal hate crime investigation. The signatories, which include Color of Change, Human Rights Campaign, NAACP Legal Defense and Educational Fund, Religious Action Center of Reform Judaism, Bend the Arc Jewish Action, Lawyers’ Committee for Civil Rights Under Law, Asian Americans Advancing Justice, Sikh Coalition, Muslim Student Association of U.S. and Canada, and Islamic Society of North America, also urge the Attorney General to hold a press conference announcing the investigation. This would be the first time a U.S. Attorney General has held a press conference to announce a federal investigation or indictment of a potential hate crime against members of the American Muslim, Arab, Sikh or South Asian communities. To read the full letter and list of signatories, click here.